Late bloomer. Large daisy-like flowers, large tapering hairy leaves. Prefers meadows and woods. Notes: Aster (Sunflower) family. 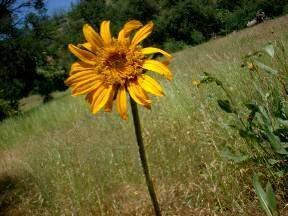 Ours has been identified as Narrow-leaved Mule's Ear, Wyethia angustifolia. The genus is named for Nathaniel Wyeth, who was the first American in what is now southern Idaho. There are seven species in our area. The large leaves grow vertically; this, with the dense hairs, helps reduce evaporation . When you see a hillside of Mule Ears, you can be pretty certain that the hillside is volcanic, as the plants are ideally suited to reach the water that has seeped deep into the porous volcanic soil. The Maidu fermented the roots on heated stones in the ground for 1 to 2 days, then ate them. They have a sweet flavor. The roots were also used to make a poultice to relieve pain and bruises. Nevada Native Americans ground the roots, soaked them in water, and drank the solution to induce vomiting. The leaves are poisonous but an essence (decoction) was used as a bath to produce profuse sweating. A tea was made with the roots and end twigs of juniper to cure colds and fever. Ours grows on the trail to the Redbud, on the left across from where the Footlhill Lomatium grows, and on the hill to the left after you cross French Corral Creek Bridge. Be on the lookout to take a larger, higher resolution photograph than the much-reduced image below.